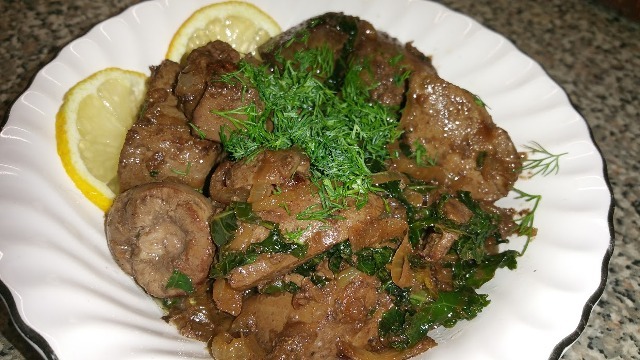 This fried liver recipe makes a delicious cooked liver which is soft and does not have a livery aftertaste. The dish cooks in about 10 minutes, and makes a very nutritious meal. No flour, no soaking in milk is used in this recipe. 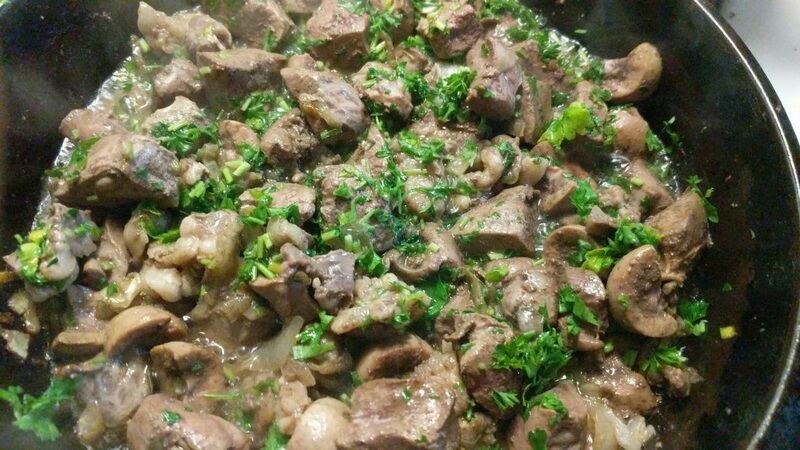 Cooking liver can be tricky as it gets hard, too chewy, and dry if not cooked correctly or if overcooked. → When you start frying the liver, you better not get distracted so it’s a good idea to prepare all ingredients beforehand. Wash them, chop them and make ready. 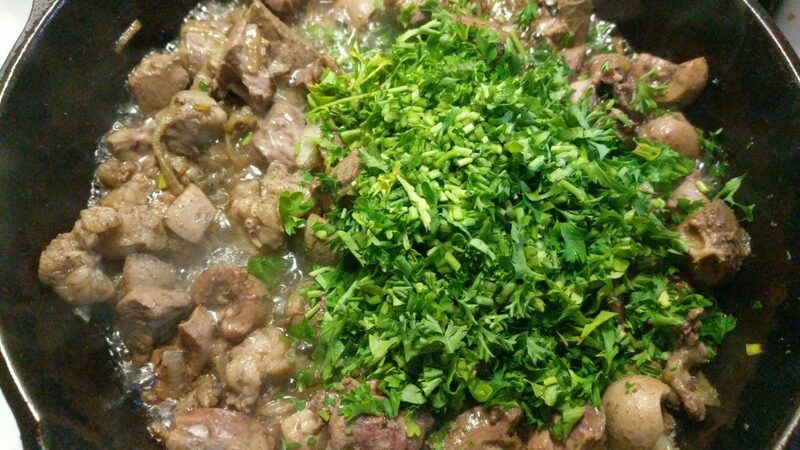 → I always use fresh lamb’s liver (and lamb organ meats) only. 1.Remove the thin outer film on the liver on both sides. 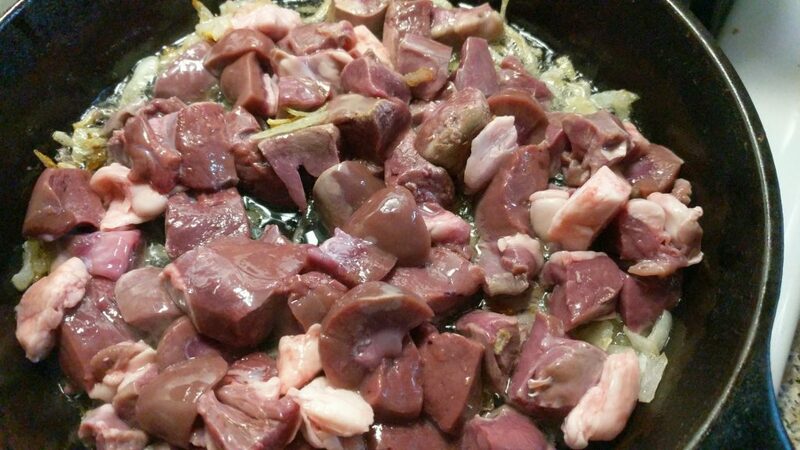 To do that put the liver into a deep bowl and pour some hot boiling water over the liver. Boiling water makes the outer film easy to remove. Removing the outer film helps prevent the liver from becoming rubbery while cooking. 2. Cut the liver into 3 cm x 3 cm cubes. You can add kidneys and heart too. 5. Make the lemon ready to squeeze or squeeze the lemon and make the lemon juice ready. 6. Put a cast iron skillet on a stove and set the fire on high. Put 2-3 tablespoons of coconut oil into the skillet. 7. 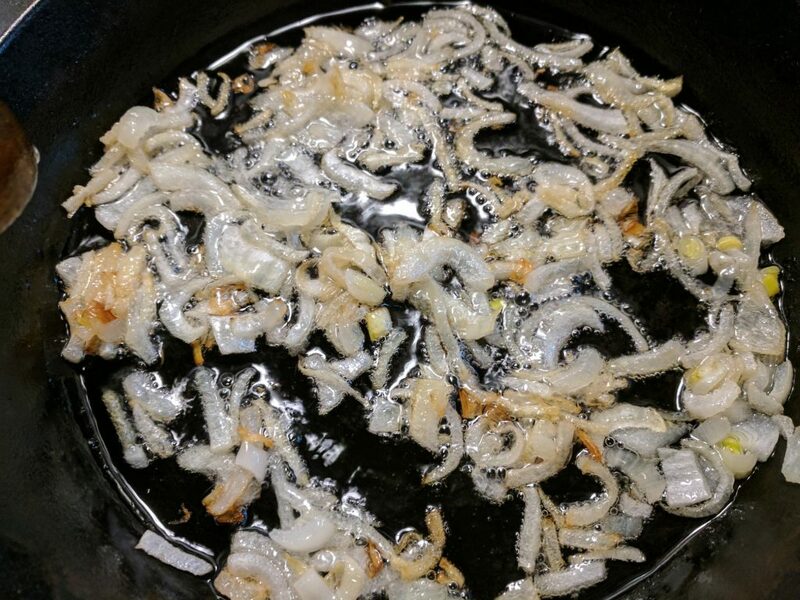 When the oil gets hot, put the chopped onion into skillet and fry it on a high heat. Mix constantly. 8. 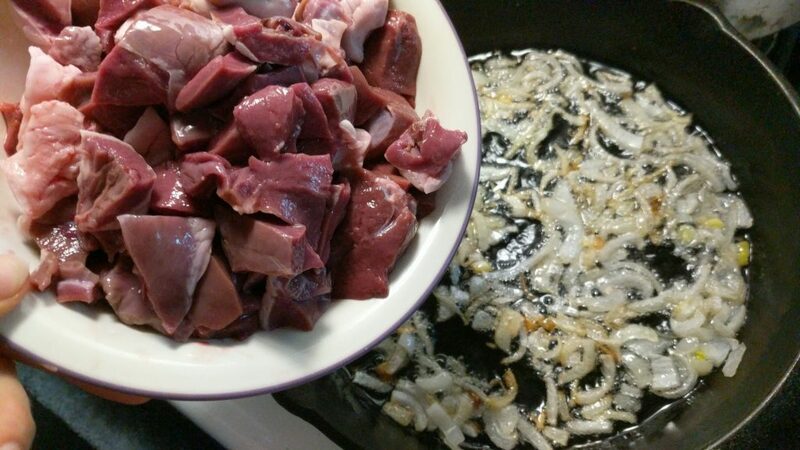 When the onion is soft and light brown, add the liver and other organ meats (kidneys and heart). Make sure the fire/heat is still set on high (important). 9. Do not stop mixing for 4 minutes. Do not add any spices yet (no salt too). 10. 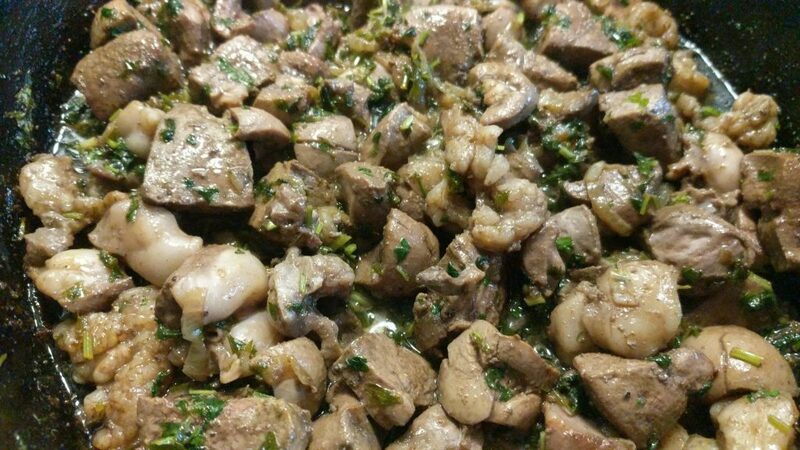 After liver is fried on a high heat for about 4 minutes, add chopped parsley, lemon juice, sprinkle some black peppers, and add the salt. 11. Reduce the heat to low. Let it cook for about 6 more minutes on a low heat. Do NOT cover the skillet with a lid (important). Mix every 30 seconds. If you cover the pan with a lid, the liver becomes rubbery. 12. Turn off the heat. Please, keep in mind that the liver will still continue to cook even after you turn off the heat. So do not delay. If you overcook, the liver gets hard and dry. 13. Cut one of the liver pieces and see if there is no blood coming out. If you see some blood, turn on the highest heat and cook for about 15-30 seconds. Turn off the heat, but do not stop mixing. 14. Serve with fresh chopped onions. You can sprinkle chopped onions with some organic apple cider vinegar before serving. Hi, Carol! I am glad you liked it too! I make this dish very often. Everybody in my family loves it!